The Milwaukee pub scene has never looked so good thanks to your epic True-Blue Brew Crew hangout next to Miller Park. 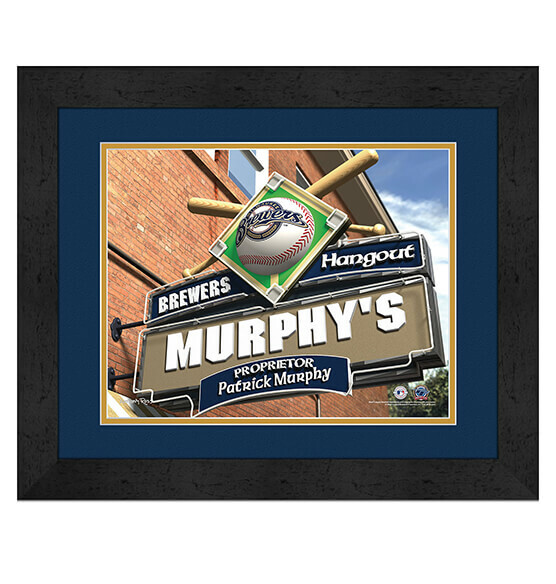 This custom Milwaukee Brewers Personalized MLB Pub Sign Framed Printed Art is easily personalized — just specify what you want printed on the marquee. This "sign of a sign" features the official Brewers logo and team colors in a crisp, vibrant print nestled behind glass for a great-looking addition to your fan cave. This Brewers sports decor looks great from its MDF vinyl-wrapped frame and generous size to its attention to detail. It arrives ready to hang with a convenient sawtooth hanger.